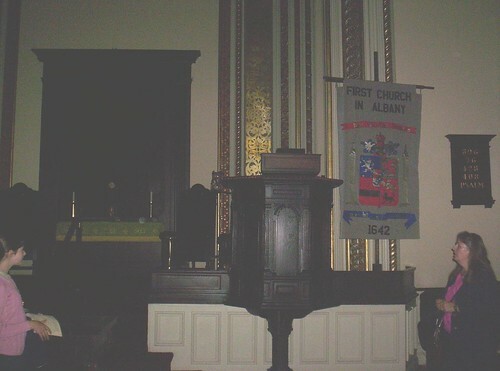 The First Church in Albany is the second-oldest church in New York State and houses the oldest pulpit in the United States. Originally called the Dutch Reformed Church in 1642, the place is loaded with history. We got the chance to attend a Sunday service and tour the church two summers ago. It was wonderful! My daughter, an Alexander Hamilton fan, was thrilled to be in the church of his wife’s family. Hamilton’s Upstate memorial funeral service was also held here in the church. 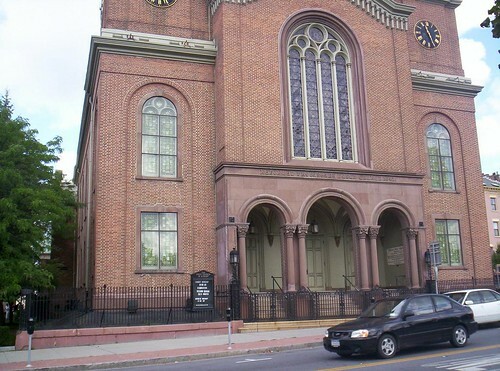 And Theodore Roosevelt attended the church during his years in Albany as governor. 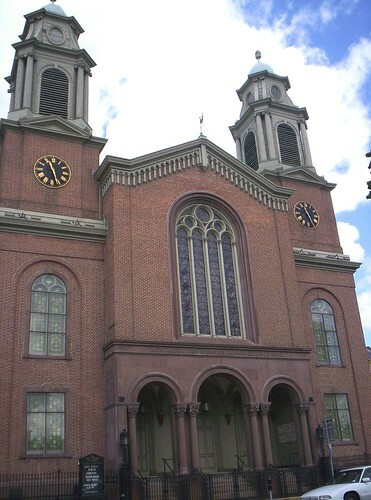 The church was recognized by Congress in 1974 as a National Historic Site. Albany is New York State’s capital city. The Hudson River connects Albany with New York City. Historically, this water route has been the only way people could move from New York City to Upstate New York. Therefore Albany has been an extremely ethically-diverse city from the beginning. We arrived to Albany early Sunday morning, barely making it in time for the church service (Albany is a 2 hours+ drive for us). The church service was sweet and simple. The parson preached from Matthew 18:15 (“Moreover if your brother sins against you, go and tell him his fault between you and him alone. If he hears you, you have gained your brother.”). There were not many people attending the church that day (I guess on Labor Day, many clear out of the city and head for the vacation areas), but the people we did meet were extremely friendly. One lady (I think her name was Mary) offered to take us for a light tour of the church. What a treat! 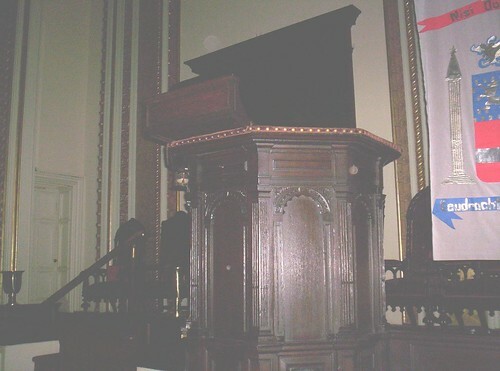 She took us to the front of the sanctuary, and showed us the famous pulpit. 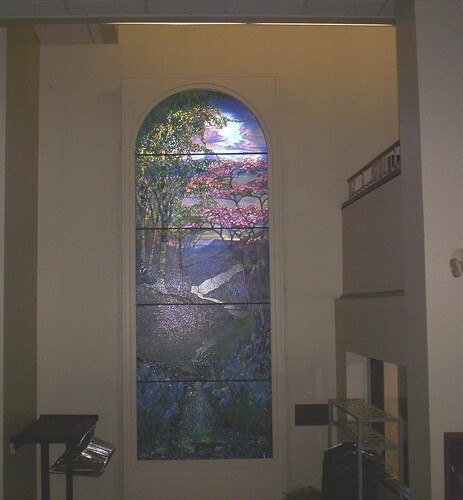 We also saw a lovely window made by Louis Tiffany, which seemed to be the pride and joy of the congregation. Something even more intriguing, in my opinion, was the framed Charter of Incorporation, established in the 1720 and signed by King George I. It was a stunning preservation. 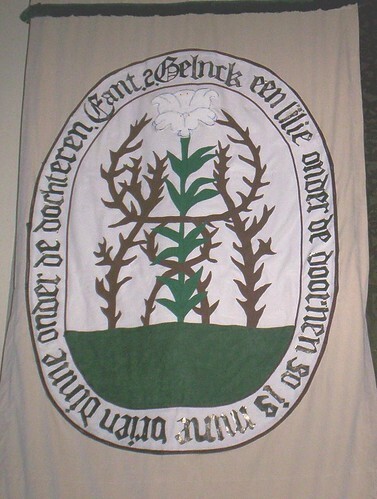 A huge wax medallion with the King’s seal hung from the charter. I was not allowed to take a photo because the flash could diminish its ancient writing. We also saw the historical 1656 Dutch weathercock, which had been the city’s central landmark until after the Revolutionary War. Today, the church has few Dutch members, but boasts a huge multicultural congregation. They have a large ministry dedicated to helping the poor of the city, too. I was intrigued by hearing about their “drive in” services they offer. There is a beautiful cobblestone-paved park next to the church with benches, trees, and flowers. We walked through it and it was lovely. It had a European, cottage-garden atmosphere. It is named “Clee Park,” in honor of one of the church’s previous pastors. I didn’t get a good photo of the park, but you can see a portion of it in the picture below. If we are ever in Albany on a Sunday, we hope to visit again! Yeah, it was a really nice church! A marvelous relic of New York’s rich past! This church, and its people, have a tremendous story to tell. Anyway, it has a rich historic heritage. BTW, the text to the eulogy of Hamilton that was preached by Rev. 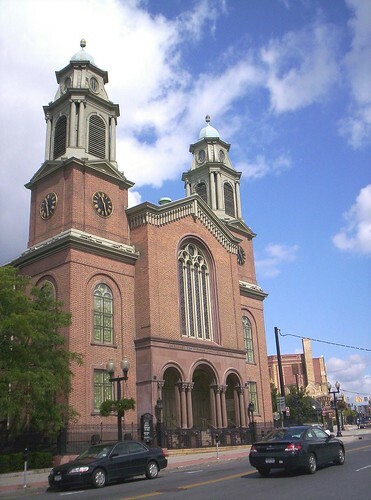 Eliphalet Nott, attended by Hamilton’s widow and her children, can be read here.